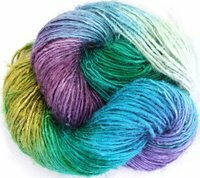 Ok, so here is the shiny NEW HandPainted Seashore Pixy Wooldancer colourway being paraded by the textural, lusterous & personality-rich HandSpun Throwsters Silk yarn!! Each skein is HandPainted by ME in a limited quantity. The skeins are all different lengths & weights. If you have a special project in mind and need more, be sure to ASK, & I'll be happy to dye it especially for you! I can also dye colours by request - please order your favourite palatte via Contacting Me, la Wooldancer, through this blog or my store www.wooldancer.etsy.com. There is only a limited quantity of handspun throwster silk yarn available in stock at the moment, so JUMP IN & grab your luxurious handspun silk NOW!! Throwsters Silk fiber is a recycled by-product that when handspun produces a lusterous, shiny, personality-rich handspun yarn with a unique quality & beautiful silky drape. 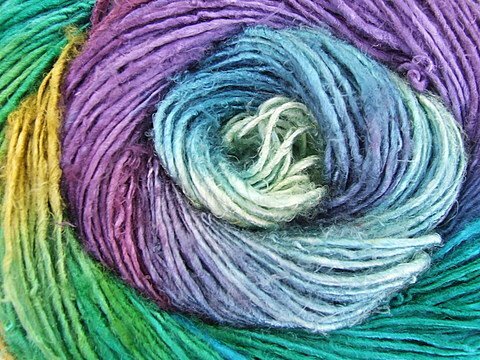 The "Throwsters Silk" is made from long fibers that didn't quite make the machine-spun silk yarn during the reeling process. 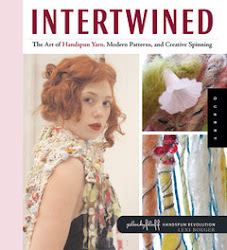 The thrown silk fibers may have been tangled around the machine or otherwise unable to be used for finished silk yarns. Unlike any other silk fiber on the market, recycled Thrown Silk is an inexpensive high quality long silk fiber that can be spun with variying twist to create textured or smooth, lusterous yarns. 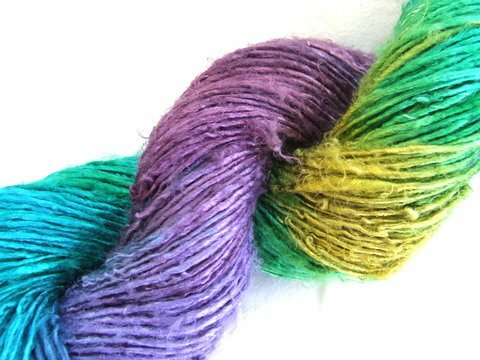 Here are some preview pics of the NEW Wooldancer HandPainted HandSpun Silk yarn NOW IN STORE!